When you've got a green thumb, you don't make New Year's resolutions to jog more. You resolve to make your garden better than it was the year before. One of the best ways to do this is by starting your own compost pile. Composting happens naturally every day. Leaves fall. Trees and grass die. As they break down and decompose, they release nutrients back into the ground, which helps living plants grow and thrive. By creating your own compost pile and blending that nutrient-rich material into your soil with a cultivator, you can create a garden that's lush, healthy, and productive. The benefits of composting go far beyond a flourishing garden! If that wasn't enough, by reducing if not completely eliminating your use of chemical fertilizers, you'll save yourself money year over year. That's another kind of green that's easy to appreciate! For your compost pile, you want a mixture of about two-thirds "brown" materials and one-third "green" materials. You can even use sawdust in moderation. Just make sure that no chemicals have been added to whatever you put in the pile. If it's something organic that you would normally throw in the trash, add it to your compost pile instead. Fresh grass clippings, green leaves, recently pulled weeds, and other bits of lawn debris that haven't dried up also count as "green" materials. Shredded newspaper used to be a popular ingredient for compost, but nowadays, many gardeners prefer not to allow the chemicals from printing ink into their soil. If this is your first foray into composting, we recommend going with an open pile, as it takes less effort and money to get going. After you've added all the items to your compost heap, you need to let it cook, so to speak. As the materials decompose, the pile will get heated. The ideal temperature for the core of the compost is about 160 degrees; it should feel warm to the touch. Much like slow-cooking chili, you'll need to mix the compost as it cures. 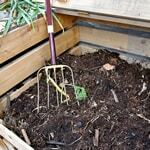 By turning your compost pile, you promote balance between the "green" and "brown" materials. You also help spread warmth from the interior of the pile to the exterior so that your material decomposes evenly. Be sure to water your compost regularly. Although you don't want your pile to get too damp, keeping it about as moist as a wrung-out sponge will allow the material to break down at a healthy rate. After the materials in your pile have decomposed for several weeks, it's time to put all that wonderful compost to use. Fertilize your garden: Spread your compost across the earth and mix it into the soil with a cultivator. This will add nutrients several inches down into the soil bed. 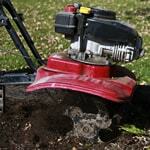 Fertilize your lawn: After you sift the compost to remove the largest chunks, you can spread it over your lawn. The compost will be absorbed slowly as the season goes along. Composting happens all the time in nature, but by creating your own compost pile, you can bring the bounties of nature into your own backyard. Using compost in your gardening is an easy and affordable way to improve and sustain the health of your plants. Tips on Composting - Find Out How to Compost For Your Garden. Our rototiller how-to library can help you pick the perfect electric cultivator, gas cultivator, front tine rototiller, rear tine garden tiller or garden tiller accessory.